This piece is dedicated to Diego Innocenzi. PDF score. 3 pages. Duration - 4 minutes. Basic level. When you create, miracles happen! 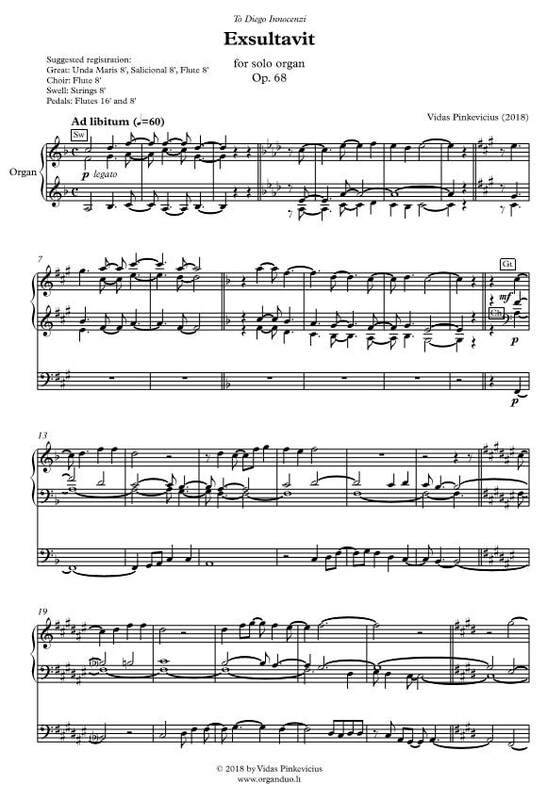 This piece is dedicated to my friend organist Arturo Barba Sevillano. 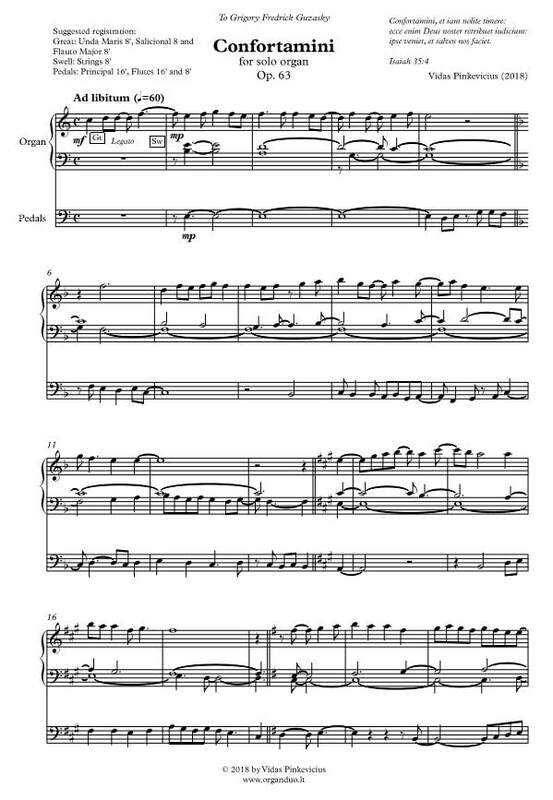 This piece is dedicated to my friend organist James Flores. PDF score. 4 pages. Duration - 5 minutes. Intermediate level. 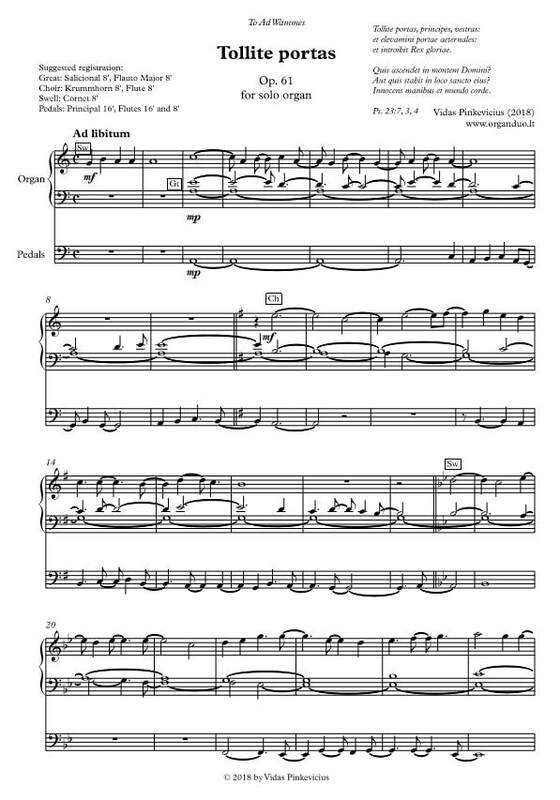 ​This piece is dedicated to my friend organist Stephen Tharp. 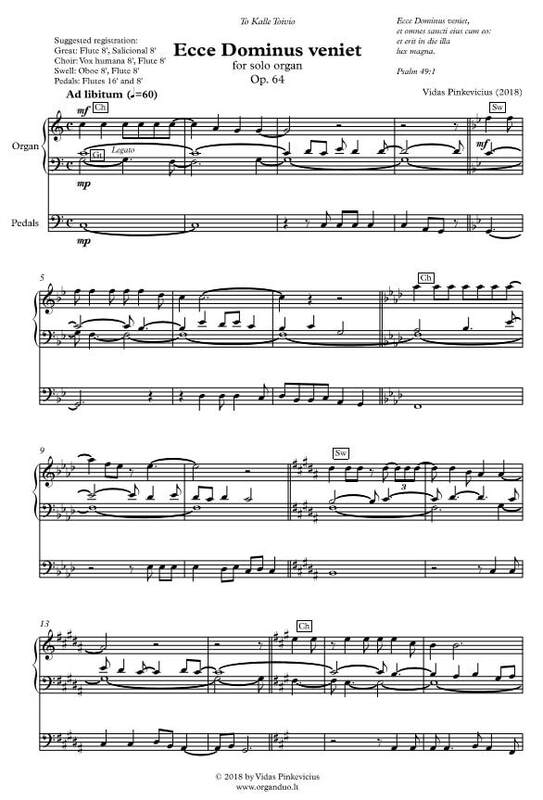 This piece is dedicated to my friend organist Kalle Toivio. PDF score. 4 pages. Duration - 5 minutes. Basic level. This morning I created Confortamini, Op. 63 for solo organ. 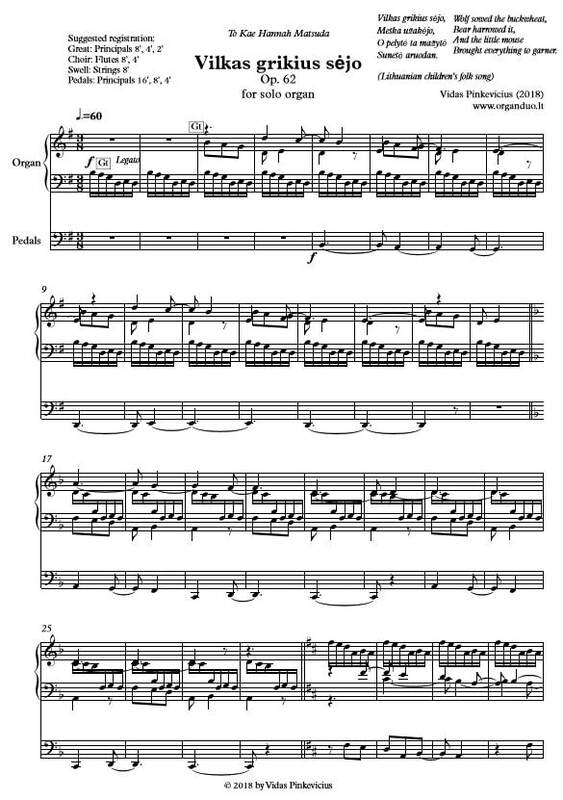 It is dedicated to my friend organist Grigory Fredrick Guzasky from the US. 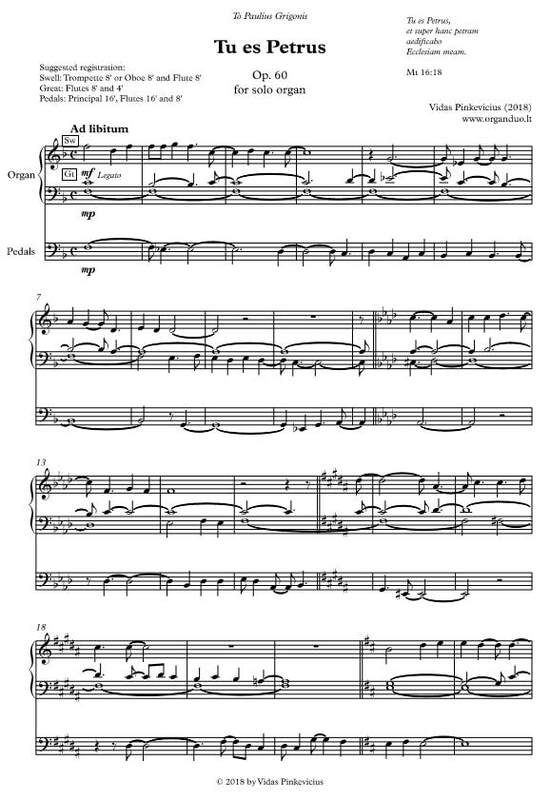 This piece a free paraphrase of the Gregorian chant Offertory for the Monday before Christmas. To make it more colorful, I changed the mode and transposed the theme a few times. It will sound nice with the dialogue between Unda Maris and the pedal stops on your organ. PDF score. 2 pages. Duration - 3 minutes. Basic level. This work is dedicated to Kae Hannah Matsuda. I decided to dedicate this piece to her because of her coming to participate in Lithuanian Song Festival this summer. This composition is based on a delightful Lithuanian children's folk song about the wolf who sowed buckwheat. It has 4 sections - each section for one song phrase. Basically, it's a series of multiple canons in augmentation, double augmentation and quadruple augmentation. The registration is done for at least a three-manual organ in mind. The fast sixteenth-note episode is followed by the episodes in quarter-notes, eighth-notes before returning to sixteenth-note culmination at the end. Advanced level. 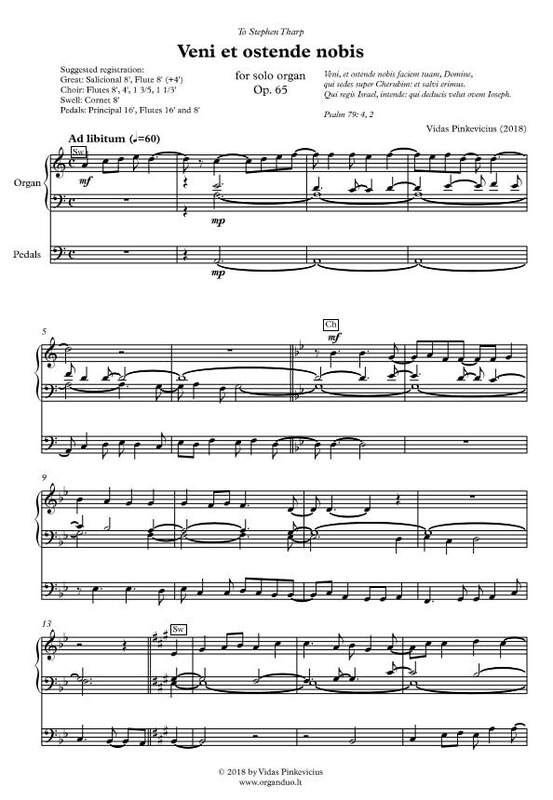 PDF score. 5 pages. Duration - 4 minutes. ​When you create, miracles happen! This morning I created Tollite portas, Op. 61 for solo organ. It is dedicated to my friend composer Ad Wammes from the Netherlands. 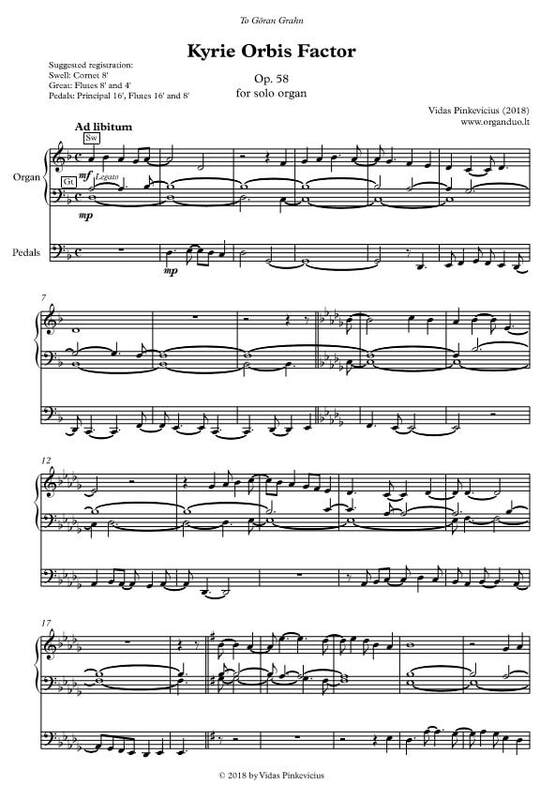 This piece a free paraphrase of the Gregorian chant Gradual for the Monday before Christmas. To make it more colorful, I changed the mode and transposed the theme a few times. It will sound nice with the dialogue between the Cornet, Krummhorn and the pedal stops on your organ. PDF score. 6 pages. Duration - 6.5 minutes. Intermediate level. This morning I created Tu es Petrus, Op. 60 (2018 for solo organ. 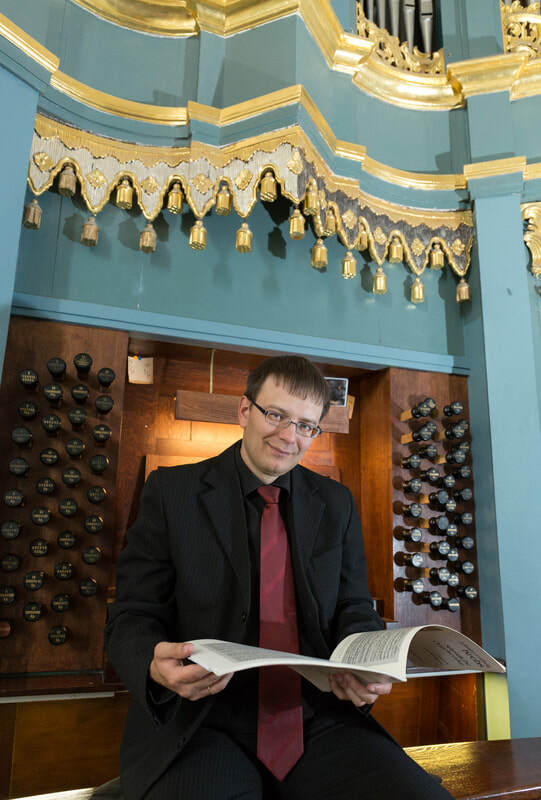 It is dedicated to my friend organist Paulius Grigonis. 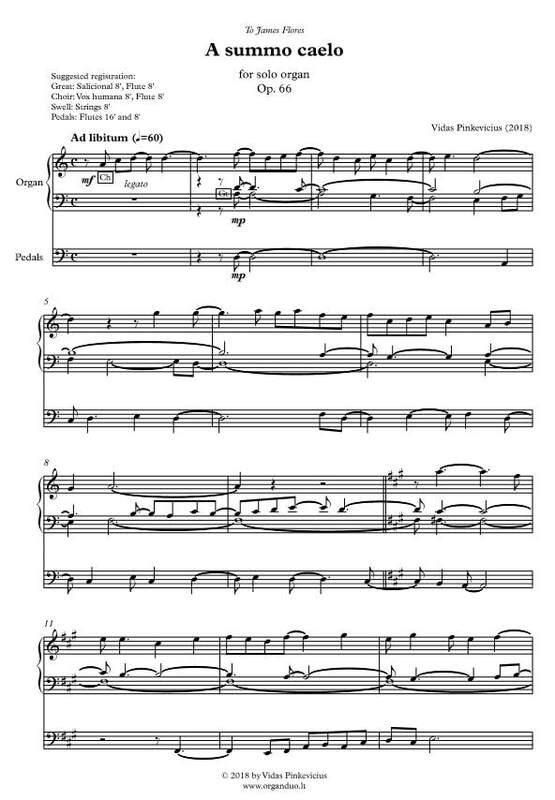 This piece a free paraphrase of the Gregorian chant Communion for the Solemnity of St Peter and St Paul. To make it more colorful, I changed the mode and transposed the theme a few times. It will sound nice with the dialogue between the Trompette or Oboe and the pedal stops on your organ. PDF score. 3 pages. Duration - 3 minutes. Basic level. I don't know why, I don't know how but the only melody that I heard in my head last night was Kyrie eleyson from Orbis Factor Gregorian chant mass. 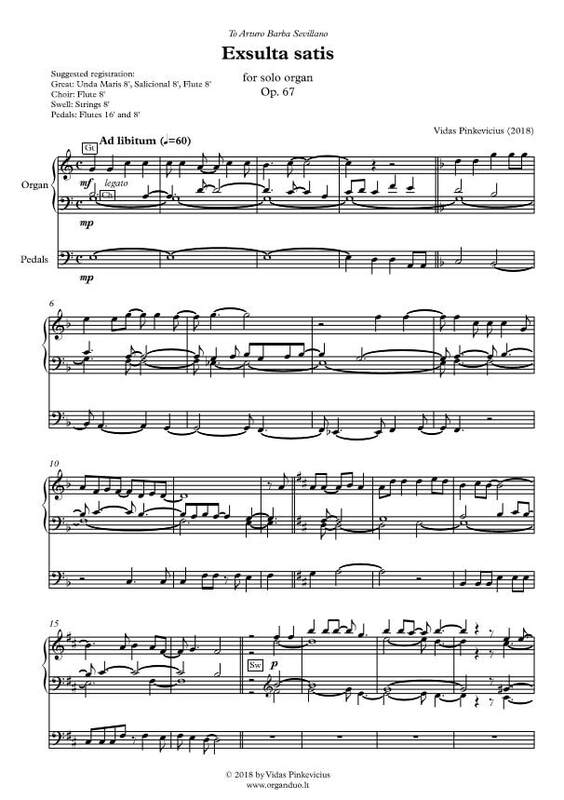 So I literally didn't have a choice when I wanted to dedicate a piece to my friend Swedish organist and organ expert Göran Grahn on the occasion of him visiting Vilnius. It's a free paraphrase of the chant. It will sound nice with the dialogue between the Cornet and the pedal stops on your organ. PDF score. 2 pages. Duration - 2 minutes. Intermediate level.